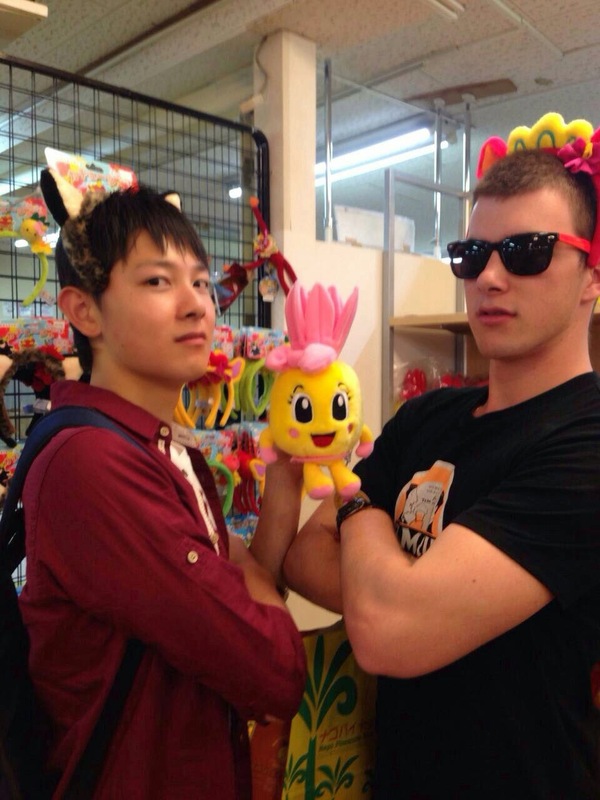 Japanese Adventure: Okinawa and some real good times! Monday morning was an semi early get up and the weather was really packing it. There was some question as to whether we would be able to actually fly out to Okinawa. We all packed in buses at the Gero train station and set off on our way to the airport, a two hour drive that I pretty much knew backwards because I've been there so many times. The bus ride up was fun though, everyone was excited for the trip and you could see it. There was some movie playing on the tv at the front of the bus but I didn't understand much of it so I went to sleep. We arrived at the airport and it turns out that half of the kids have never been on a plane before! All of my mates were asking me all sorts of questions about how it all works. We had some time in the airport to get some food and I knew exactly what I wanted and where it was. I told my mates that I was gonna go and get some subway and they said they were keen for a sandwich too. We get in line and there are a bunch of Englishmen in front of us. With thick British accents they tried to communicate with the poor young Japanese staff. It was painful to watch but I chuckled a little because I know the language barrier quite well. And I told him in Japanese that I'd like all of the salads with extra onions. My mates laughed as the shop assistants looked at me with jaws dropped. It was quite cool. And it turns out that my mates had never had subway before and were confused as to how to eat the sub. I thought that was a laugh. The plane ride was so smooth I almost didn't believe we had landed! We all piled into buses and made our way to the "Kokusai-dori" which is "international road" and looked around for some grub. We split off into groups and started looking through souvenir shops and checking out the menus of restaurants when we decided to hit up this nice looking steak house. Chicken steak and real steak! After our big feed, we did some souvenir shopping. I got some cool stuff and paled when I checked my receipts afterwards. Of course this touristy tropical island is going to burn a hole in my wallet. 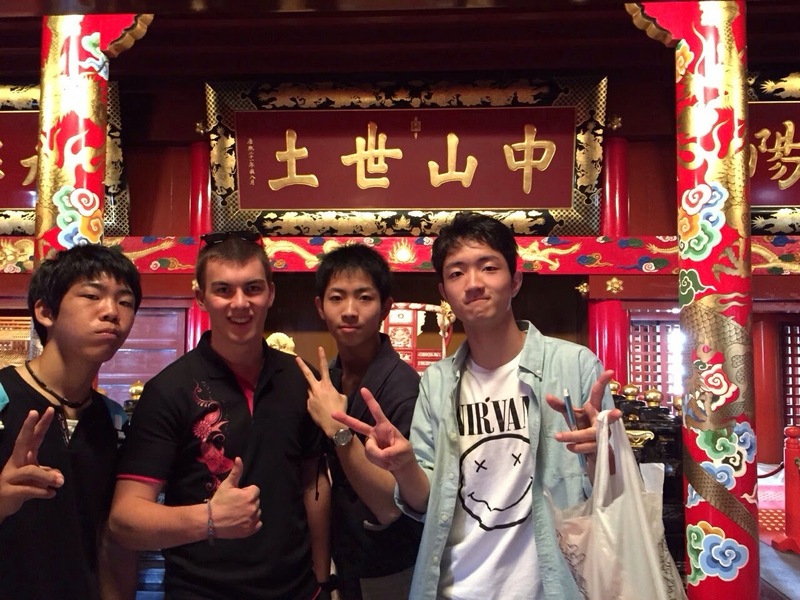 We found the hotel but met up with some other students and a teacher on the way there. I found a vending machine that was selling mountain dew, a seemingly rare drink in Japan. Anyway, I was drinking and walking and everyone kept asking if I was drinking some sort of alcohol. I told them what it was and they just looked perplexed but I thought I could make a joke out of it with one of the teachers I get along well with. He looked at me without hesitation, or without even looking at the can for that matter, and stole the drink and sculled the whole thing. I laughed and walked away feeling slightly defeated. We all made it to the hotel and we got segregated into sexes and started searching for our rooms. The ladies got to use the elevator but us guys had to lug our luggage up the stairs. I was on the fifth floor. I locked into the hotel's free wifi and spent the night playing games with my room mates. It was good fun. 6 AM wake up for the buffet breakfast. Everyone was in their pajamas so I thought I would be fine in sweat pants and a singlet. I got in the elevator and was promptly told by one of the teachers that a singlet is inappropriate. So I had to run back to my room and change. I was slightly late for breakfast and couldn't get a seat with my friends but that wasn't so bad. There were some girls from my class sitting at a table with a spare seat so I made my way over to them cos we were all pretty good friends. But nope, can't be sitting with girls, that's a bit too racy for Japanese schools apparently. So for the majority of breakfast I was eating by myself. At least it was a decent breakfast! Breakfast finished and I went to say hi to the teachers because they were between me and the place where we dropped off out plates. My homeroom teacher was wearing a CCC shirt, so I sat down and gave him a mini lecture as to where the Canterbury Clothing Company is and how I live in South Canty. I must have talked his ear off. Today was the "education" leg of the trip. Back in the Second World War, America invaded Okinawa and bloody conflict ensued. Obviously with such a war ridden place, there are a few museums around dedicated to the memory of those who served. We went to this one place where there was a monument with all the names of the lost written on it. It's hard to explain, so I'll chuck some photos in. These plaques(?) stretched on for quite a while and resembled waves. They were justly called the "Waves of peace"
Most of the names were Japanese but there was section for all of the Americans who died here as well which I thought was amazing. It was sad to such a huge amount of people had given their lives. I was having a small moment but I looked around and saw that everyone had left me behind. So of I scuffled, trying to find my class. We entered that museum and got all set to look around. It said no photos, but I laughed at the sign and took photos anyway. I don't know why I did, they're too grotesque to put in my blog and I don't really want to go looking over them again. The museum was quite hard hitting, I thought it was a bit more traumatizing than the Nagasaki atomic bomb museum because it wasn't just showcasing the aftermath of said bomb, but instead this museum showed the real horrors of the battlefield and all else that went on during the war. It was all quite grim. We made our way through and finally came to an end, some students had slightly dropped moods, but some others were all cheers as they took selfies around the place. I just overlooked them, I thought it was a bit disrespectful though. I bought some of the local tea from a vending machine to find out it was just re-branded jasmine tea. No worries, it did the job and it tasted nice. I met up with my class and we got on another bus and made our way to the next war museum. I was told by one of the teachers that this next museum was even more hard hitting than this one. Oh dear. It took a wee while to get there so I pretty much just zoned out in the bus. I wasn't in a talking mood but I didn't want to be that one kid who sulks, so I did my best to interact with people who talked to me. The whole war scene had me a bit emotional. We get to this new site and immediately I could feel something different. But I couldn't really put my finger on what it was. We lined up to pray at this monument, but I didn't completely understand what was up. One of the teachers explained it to me. We were standing in front of this opening to a big natural cave that was used as shelter during the battles, The actual cave. It wasn't just soldiers who were using it though, back when the invasion took place, about 300 or so 18 year old school girls were enlisted into service as nurses and helpers for the military. Obviously that's quite horrible and they were subjected to the full horror of the war and many of them died from just being exposed to the brutality. But this cave was the place of their last stand. After suffering many losses and enduring so much, the Americans had overtaken their position. They stayed in the cave and the enemy gassed it out, killing all of those who hadn't fled or been shot. And we were standing right there, where it happened almost 70 years ago. That was quite eerie. We went inside and filed into a big auditorium. We were going to listen to a lecture from one of the girls who was enlisted. It was hard to understand her because she used words that were well beyond me and she had this odd Okinawan accent that I hadn't figured out yet. But the I got the jist of what she was saying. She talked about looking at the sky in disbelief as it was filled with American planes. She talked about her friends dying around her and how she dealt with injured soldiers even though she didn't have any medical experience. And she also said she was glad when she survived and found her Mum. Lots of her friends died but some of the people who made it through had lost family members and she told all of us listening to give our family a huge hug when we got home. I thought she gave a pretty powerful speech. Some kids slept through it though and I wasn't too happy to see that. But off we went again, to look about the museum. I didn't take many pictures this time though. This museum was a lot more personal, it had names and photos and really showed a more human side of what happened. It was quite tragic to see that people my age were submitted to such a horrible fate. I was reading some of the testimonies and diaries of the girls when they were in the working in the caves. Conditions seemed to be pretty bad and obviously lots of people died but one girl's recount almost made me cry. She wrote that her best friend and her were working but her friend had been falling sick and she didn't even have the energy to eat what little rations they got. She said she couldn't see her in the dark but she knew that when she stopped shivering and crying that she had died. She carried her body out to bury it but because she was so weak she kept dropping her friend but she'd apologise every time and keep going. I couldn't even comprehend the situation. This was a girl who was my age. I walked around trying to hide my tears when one of the girls from my school came skipping up to me and asked if I was enjoying myself. I feel bad about it now, but I snapped at her and almost lost my cool. I said that this wasn't really the type of thing to enjoy with more aggression than I should have. We made our way out and went off looking for lunch. We were having a standard lunch as a school, so food was a little sparse. But that's cool cos I wasn't so hungry. As we were eating I decided to stop feeling down because it wasn't going to make anything better. I put the memories of what I just seen to the back of my head and started to look forward to the afternoon's activities. We were going to the beach! After the feed, we got back on the bus and zipped off to the next hotel which was right in front of the beach. And then we hung out on the beach until late! A bunch of guys were trying to carry one of the bigger P.E. teachers into the sea but he wasn't having a bar of it. When I say bigger, I don't mean he was overweight, he was just massive. 8 of us guys couldn't move him into the water so with our logical male brains, we decided to challenge him one by one in judo/wrestling. It had a lot to do with the fact that there were lots of girls around and also the fact that who doesn't enjoy fighting on the beach? I am proud to say I stood my ground longer than any of the other guys but there was no way this man was going to be thrown around by a wee white guy like me. We grappled and had a small battle but then he threw me and sent me rolling through the sand. I went back for more but to no avail. We hung out on the beach for ages! We got to ride some cool inflatable things that were pulled behind jet skis at speeds that probably weren't legal. We swam in the beautiful water of the Okinawan ocean and had an awesome time. Slowly but surely, the tide came in and it surprised me! I went in the water at the start of the afternoon only to be a tad disappointed because at the farthest point (there was a roped boundary) the water only came up to my waist. But when I went back in a few hours later after a few games of volley ball and other beach shenanigans, I went back in to find that the water was up to my neck with the waves going well over my head. It was pretty neat. But it started to get cold and our time at the beach was nearing an end. We lined up and listened to someone say something that was lost on me because I was far away and pulling funny faces at my friends. We all started filing back into the hotel to have warm showers and get ready for a buffet dinner. I let all of my mates go before me when it came to the shower. I was enjoying the view over the beach but I started to get a little cold so I was grateful when everyone had pretty quick showers. I had sand everywhere and it wasn't nice. I even picked some small shells out of my togs. I got dressed for dinner and off we went! So I asked why she was working in Okinawa and I got a pretty cool answer. She said she got sick of her last job so she simply quit and decided to come to Okinawa because it's a cool place and she loves karate! (Okinawa is the birthplace of karate.) I told her about my Kyokushin and we had a good yarn. I asked what belt she was and she looked at me, with equal parts challenge and pride in her eyes and said: "Brown belt!" I told her that was awesome and smugly said that I was a black belt. She smiled at me with a slight look of defeat but it was in a joking way. I went back later and she remarked on the fact that I was from New Zealand, even though I never said I was from NZ. I'm still not sure how she found out. We all went back to our rooms and made the most of the free time by milling about the hallways. It turns out that everyone had come out to take photos with everyone. It was like a weird ritual. Girls would carry their phones around asking the boys (and other girls) to take a photo with them. It was always the same pose and the same request. It got really weird when I showed up, it was like I was a rare commodity and everyone rushed to get a photo. I felt pretty cool, but I still thought the whole thing a bit odd. I got lots of photos with lots of girls! I felt real cool! Everyone was out wandering the corridors until late but soon enough the teachers came along and sent everyone back their rooms. A couple of my roommates had some running practice to do in the morning but they were already keen to do some press ups and what not before bed. So I joined in and got quite a sweat up. One of my best friends was my roommate for the night and he used to do karate when he was younger so we had some play fights and then talked for ages out on the balcony. The view was honestly amazing. I had another shower and went to bed. We got up at 6 and realised brekkie was at 7 so we lazed about for a while. Breakfast was much the same as yesterday's feed. Hey, that's not a real whale shark! It was an awesome day at the aquarium. 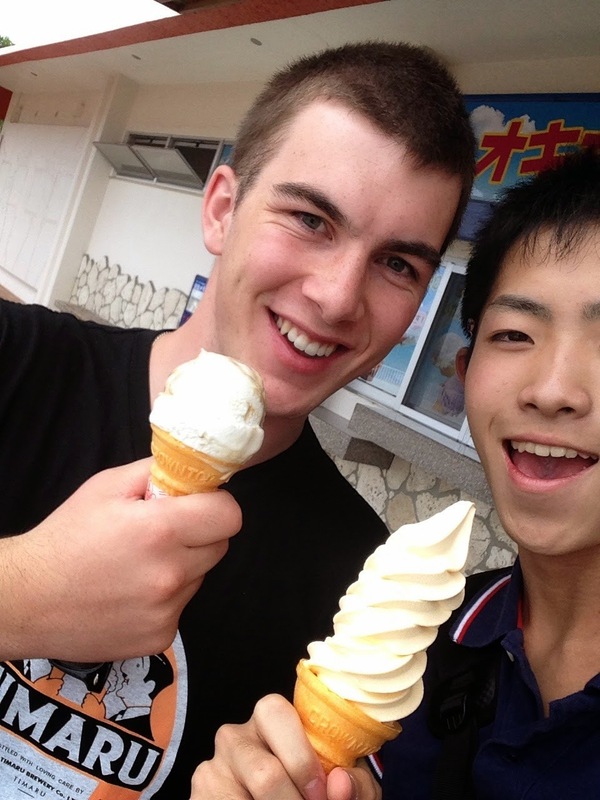 It was pretty hot so Nobu and I got ice creams. I made the better decision by not getting a soft serve, but Nobu quickly found out why when his started melting all over his hands. It was hilarious. From the aquarium, everyone broke up into pre-organised groups and got in taxis to take on the island. We had spent some time in school planning out some places to go. I wasn't too sure of the plan but Nobu had it sorted. We had a really cool taxi driver but none of us could understand his accent so communication was slightly awkward. We started off with this place called: "Pineapple Park"
Ready to do some pineapple things! Even Christpher Columbus likes pineapples! It was actually really cool, we got some neat photos taken and learnt a bit about the delicious fruit. Even got to try some pickled pineapple but I wasn't allowed to try the pineapple wine. There was this incredibly catchy/annoying tune playing the entire time we were there and we found ourselves singing about pineapples for the rest of the trip. Next we went out for lunch and we were having traditional American food! So I came all this way to Okinawa, Japan, and all my mates voted to go to this "American restaurant." We then made our way to this other beach to get some underwater photos? I didn't really understand what we were doing but I was just rolling with it. This was the best photo from the bunch I took underwater. I stupidly forgot to take a photo of the place we took the photos from. A bunch of us being cool on the beach! It was an interesting little trip. But our next destination was as odd as lunch was. 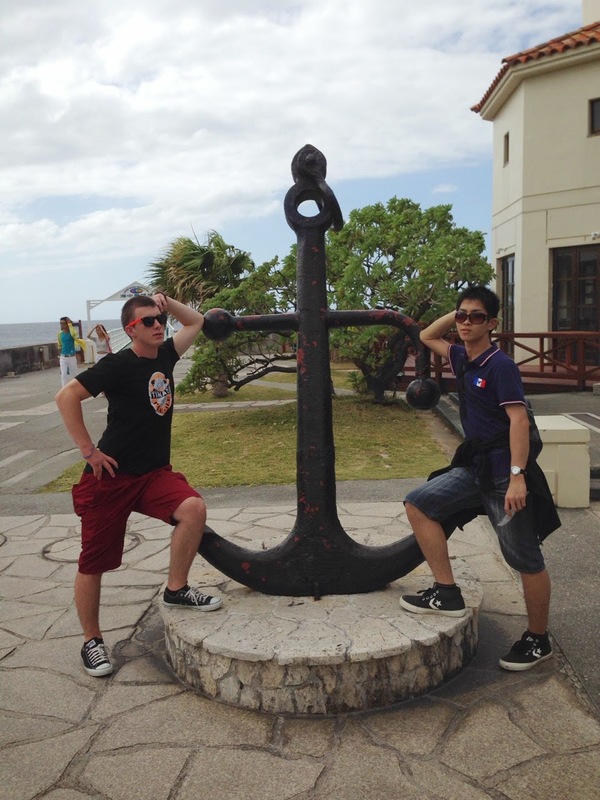 We were in Okinawa and everyone wanted to go to the "American Village." Supposedly an American style chain of shops. Like a mall or something. In my western opinion, it was very standard. There were a few American outlet shops that were playing English music. The Japanese loved it! We quickly realised that none of us wanted any clothes so we went and hung out in the games centre which was just across the road. We then got into our taxi and made our way to the last hotel. It was a pretty flash place. I arrived first so I assumed the ancient tradition of "First in first served." The ontray was pretty nice and then the food just kept coming! My roommates and I played cards and watched TV until late and it was great fun! Tenpei is one of my best friends here, he's in my class and I do kendo with him. He's quite quiet but when we do kendo he turns into this different person and it's awe inspiring. Last year, he was one of the two first years to be on the kendo A grade team with the third years, so he's pretty damn strong. The last day had everyone slightly sad, no one wanted the holiday to end. But it was still a good day! We were going to see a castle. Much the same as the last one, but this one has walls! We didn't have much time so we had to rush through which I thought was a bit of a shame because it was a really nice place. I still managed to get an icecream though! We made our way to the airport and then off we flew. There was a small bit of waiting around but it went by pretty smoothly. It was such an awesome trip! But there was still a lot of traveling to get done before we would be home. I felt so clever when I showed my juice/tea box to the teacher who was sitting next to me. He laughed at me when he saw that I had shoved it into the round cup holder and then almost cried when I tried to get it out spilled tea all over myself. I gotta stop doing these things. It was a bumpy flight home but kids were so tired that they slept like babies. We landed back in Nagoya and everyone was walking on those cool conveyor belts that are just flat along the ground. They were all standing on them so they were moving at a pretty standard pace. I decided to be a smartass again and got a fast walk going. Everyone laughed when I casually walked past them on the normal ground whilst they were taking the express lane. It was a good time. We all picked up our bags and got back into those buses. This time I slept for most of the journey home. I got back to the station and my host Mum was waiting for me. When I got home I had a shower and went to bed. I was supposed to be going to school the next day but we had made plans to check out a festival in Takayama instead. Courtesy of host Grandma. looking out for me so I didn't have to go to school! Some raw beef sushi on a rice cracker! Delicious! Those guys on the left were working for the BBC, I used my English skills to ask them! There were all sorts of parades and even this dog was getting involved! We walked around town all day and it was great. The weather was good and Takayama had plenty to show. I got to try a few different types of sake and eat a bunch of free snacks. We met up with a friend and went out for dinner. We had eel! I don't know how but I forgot to take a photo of dinner but it was pretty delicious. We got home late and we were all tired from walking and driving all day. Saturday was a good long lazy day. We all slept in and it was great. There was a small event on in the evening which was quite interesting. There was this shrine (that I used to pass everyday on the way to and from school) that was putting on some show. It was a half hour traditional musical/dance with some cool as lighting. Half of town turned up! They had this eerie flute thing and it sounded quite amazing but it gave me chills. After the music stopped we could hear our stomachs rumbling so we went to a nearby ramen shop and pigged out on those noodles that I love so much. Sunday was supposed to be a lazy day but after a long time of saying that I was going to do something about my slightly swollen belly and telling my family that "I'll diet from tomorrow!" I decided to hit the gym and take some action! I went with host Grandma and one of my sisters. We started with the treadmills and I ran until I was sweating like anything. I hit the weights and got quite a decent work out. It was a good feeling. We finished on the bikes and once again I was sweating like crazy. Grandma said it was yakiniku for dinner and I got so excited. It was like I could almost smell the tantalizing meat already. But I really could! There was this smell and I couldn't figure out what it was. It was kinda garlicy. "Yes! It's you! you're sweating out all that garlic from yesterday!" Yuck. I thought that was pretty gross but there was nothing I could do about so I just kept on biking. I went in the onsen after the gym and it was so relaxing. We got home and sure enough, yakiniku was waiting for us. It was so good. So, so good. Host family whipped out this big pan and we grilled so much meat I thought I wasn't going to be able to eat it all. But I did. And I thought I was gonna explode! Monday was another lazy day but I decided to go to the gym again. I did three hours and it felt great. I walked home with a sense of accomplishment and some tired muscles. That's all for the moment, there is a whole other week to talk about but that'l have to wait for a moment because I need to sleep. Okinawa was absolutely amazing and I can't wait until I can go back sometime and make my own way around the island. The memories from that trip will be with me forever though, and what good memories they are. I'm truly living the dream everyday here.